PACKAGE THIS TITLE WITH OUR 2016 MLA SUPPLEMENT, Documenting Sources in MLA Style (package ISBN-13: 9781319084936). Get the most recent updates on MLA citation in a convenient, 40-page resource based on The MLA Handbook, 8th Edition, with plenty of models. Browse our catalog or contact your representative for a full listing of updated titles and packages, or to request a custom ISBN. The Language of Composition is the first textbook built from the ground up to help students succeed in the AP English Language course. Written by a team of experts with experience in both high school and college, this text focuses on teaching students the skills they need to read, write, and think at the college level. 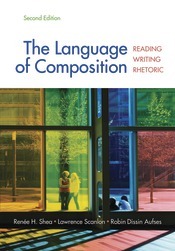 With practical advice and an extensive selection of readings — including essays, poetry, fiction, and visual texts — The Language of Composition helps students develop the key skills they must master to pass the course, to succeed on the AP Exam, and to prepare for a successful college career. Revised based on feedback from teachers across the country, the second edition promises to be an even better resource for the AP Language classroom. "This is the ONLY textbook I recommend to new AP teachers. It is well-organized, clear, and rich."